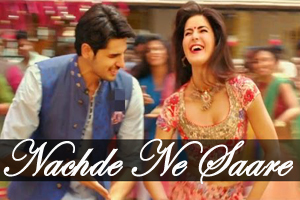 A dance song sung by Siddharth Mahadevan, Jasleen Royal, Harshdeep Kaur featuring Katrina Kaif and Sidharth Malhotra. The video of this song is available on YouTube at the official channel Zee Music Company. This video is of 2 minutes 35 seconds duration. Lyrics of "Nachde Ne Saare"
Lyrics in Hindi (Unicode) of "नचदे ने सारे"